AMD has announced a new GPU gaming bundle. The new 'Raise the Game' bundle consists of not just one but three new PC games. 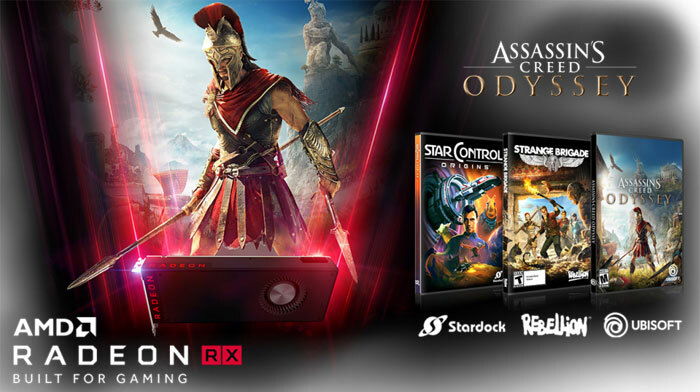 Buyers of the AMD Radeon RX Vega, RX 580 or RX 570 graphics cards bought from qualifying retailers during the qualifying time frame (as long as codes are still available) can claim Assassin's Creed Odyssey, Strange Brigade, and Star Control: Origins - for free. Of the games on offer Ubisoft's Assassin's Creed Odyssey is the biggest, from the very well known franchise. It has been mentioned twice in HEXUS news this year. Ahead of E3 it was teased, and was a big part of the Ubisoft event as a 'world premiere' when E3 kicked off. Assassin's Creed Odyssey is set in ancient Greece and allows you to play as Spartan heroes Alexios or Kassandra. The game launches on PC, Xbox One and PS4 on the 5th October. If you pre-order this title it would cost $59.99. Strange Brigade comes from Rebellion Software, makers of the Aliens vs. Predator and the Sniper Elite series. It is designed with 4-player co-op in mind (like Left 4 Dead, says GameSpot) and in the game you will work to overcome unique challenges and trials in the vein of a pulpy 1930s action-adventure film. It is set for release on PC, Xbox One and PS4 on the 28th August. Pre-purchasing this title costs $39.99. Star Control: Origins is a space role-playing game in which you command Earth's first interstellar starship on a mission to save the Earth from hostile alien empires. You will explore new and exotic worlds, meet alien civilizations, indulge in pulse pounding combat, and discover rich interstellar history during your journey. Developed by Stardock, the game is set for release on PC on the 20th September. Pre-purchasing this title costs $35.99. Adding the above prices together comes to about $136 which represents a very good value bundle, especially with the lower priced graphics cards in this promotion. The AMD 'Raise the Game' triple game GPU bundle runs from 7th August until 3rd November 2018, or while code stocks last. Codes must be redeemed before 2019. You can qualify for the bundle if you buy a discrete card or a PC system with one of these GPUs pre-installed. There is a PDF available listing qualifying retailers worldwide. Areas covered include APJ, EMEA, Latin and North Americas, and Hong Kong / Taiwan. Here in the UK qualifying retailers include CCL Computers, Ebuyer, OCUK, and Scan Computers. So I take this as proof that the new Nvidia cards are close. AMD being in the industry will have more information than is available publicly, and this is their last push before the market is full of everyone buying the new Nvidia cards, or comparing them to the previous offerings from AMD. or it could be a push to get rid of there cards before a refresh ? I haven't heard of any AMD refresh but we can indeed hope. I think the best we could hope for is a Vega 64 re-release with a refined / smaller process so the power requirements are not so high and with slightly increased clock speeds. RX480->580 type stuff. I think Gordon is right in that this is just an attempt to shift as much stock as possible before they are rendered non-competitive / have to massively drop prices. I don't understand the Vega pricing atm. The Vega 56 card I got has risen in price by a fiver since I bought it and is claiming to be low on stock at Amazon. Overclockers have their cheapest Vega 64 at a lower price than their cheapest Vega 56, both Gigabyte cards. I guess there just aren't a lot of Vega cards getting made.